The California Consumer Privacy Act, CCPA for short, was enacted on June 28, 2018. It appears to be regulating the ways personal information is being used in a transactional sense, that is when a business makes profit on consumer’s data. What’s more, it seems that it concerns the one-time use of personal information, unlike GDPR which controls data processing. Who does the California privacy law concern? What’s the main difference between GDPR and the California privacy law? 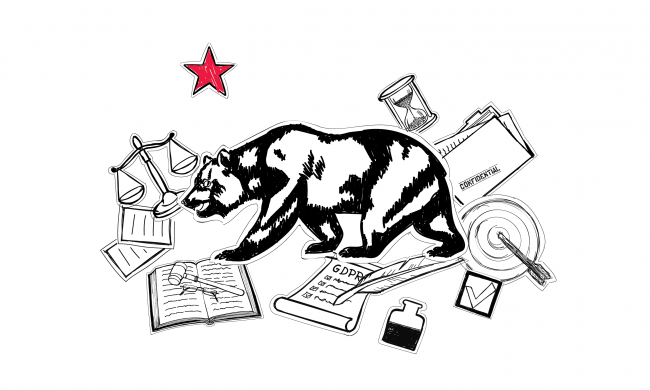 What are the rights coming from the California privacy law? The law gives Californians a greater insight and control over the ways their personal information is used by businesses. That sounds a bit like GDPR, which regulates personal data processing. However, businesses should meet a couple of requirements in order to be affected by CCPA. The law goes beyond the standard information that identifies a specific person, but also includes a kind of info that points to a person. Information that may be implied based on Social Security number, IP addresses or geolocation data is also seen as personal information. GDPR, on the other hand, defines personal data as any piece of personal data based on which you can identify a person. GDPR puts limits on the timespan when you can process the data. It also identifies consent-based grounds for using the data. The CCPA grants California residents a set of rights with which they can exercise greater control over the use of their personal information. The California Consumer Privacy Act allows consumers a few important rights to protect their privacy. California consumers have a right to know what information, or a category of information, a business is collecting about them. Similarly, they may request that a company shares the sources from which that info is collected and the purpose for collecting and selling the information. And they have the right to know who they are sharing the information with. Businesses are required to tell a consumer what information they are collecting and why they do that right after a consumer makes the request (the request needs to be verifiable). The same consumer can ask for information no more than two times a year. Companies have 45 days to provide the information that a consumer asks them for. The period may be extended to 90 days if there’s a sound reason for the delay. It can be extended only if the consumer was informed about that during those 45 days. Californians have a right to request that a company deletes their information. Businesses cannot discriminate the residents who made such a request. However, that doesn’t apply in situations when that personal information is necessary to provide a service, as in the internal communication between the service and a client. The same goes for protecting the human rights of a person, like freedom of speech or freedom of personal security. Nevertheless, it’s not the same as the right to be forgotten stated in GDPR. The CCPA gives people the right to ask a company to stop selling their personal information. Businesses are required to respect that request and cannot treat such consumers differently. Selling personal information of children younger than 16 is prohibited. The California Consumer Privacy Act is considered to be one of the most demanding privacy laws in the US. It will come into effect on January 1, 2020. There’s still room for change before it gets enforceable, but it’s a revolutionary act that has the potential to spark legislation in other US states. So how does this apply to cold emailing Mary? It’s important to note that the US tech state regulates data collection. The law isn’t as strict as GDPR. It just grants the prospect a right to ask you what kind of data you store and a right to erase their data upon request.